For the filling: In a medium bowl, whisk the cream to stiff peaks. Reserve. In a large bowl, whisk together the ricotta, orange zest, powdered sugar and nutmeg. Gently fold in the whipped cream. Fill a piping bag with the cream and refrigerate while preparing the cannoli shells. For the cannoli shells: In a large bowl, combine the flour, sugar, salt and nutmeg. Add the butter, egg yolks and chardonnay. With an electric mixer, beat at medium speed until dough forms. Place the dough on a lightly floured surface, knead dough until smooth and elastic, about 5 minutes. Divide the dough into two balls, flatten into disks and wrap with plastic. Refrigerate for 1 hour. In a medium saucepan, heat the oil over medium heat to 365°. On a well-floured surface, with a rolling pin, roll one disk at a time to 1/16-inch thickness. Using a 2-inch round cutter, cut the dough into 16 rounds. Repeat with remaining ball. Reform the remaining dough into a ball, roll out and cut into remaining 8 circles. In a small bowl, whisk the egg whites. Coat mini cannoli forms with cooking spray, wrap dough circles around forms. Brush the ends lightly with egg white to seal. In batches of 10, using tongs, drop the wrapped cannoli forms into the oil. Fry until golden, about 3 minutes. Remove with tongs, tilting the forms as you go, to drain excess oil from forms. Transfer to a paper towel, allow to cool about 2 minutes. Carefully slide forms off. In a small bowl, microwave the chocolate for 30 seconds. Stir, microwave for 10 seconds or until melted. Dip the ends of the cannoli shells into the chocolate. Then dip into the almonds. Place on a parchment-lined pan and allow the chocolate to set. Cut the tip of the bag and pipe the cream into each cannoli. Refrigerate cannoli until ready to serve. 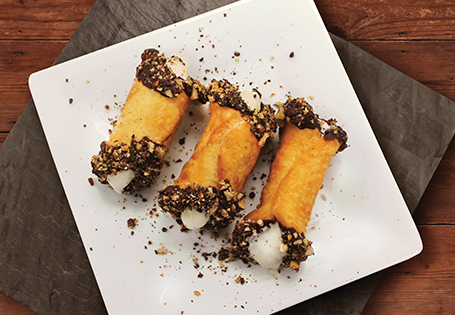 TIP: If you do not have mini cannoli forms, make your own with foil. Cut foil at 6-inch intervals, fold in half lengthwise and roll lengthwise to create mini pipes.